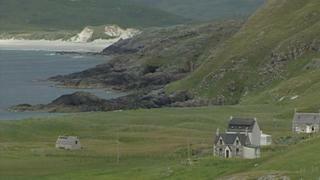 Image caption Thuirt an Riaghaltas gu bheil iad airson leasachadh susbainteach a chur an sàs. Thuirt Riaghaltas na h-Alba gu bheil taic ann airson mòran de na planaichean ath-leasachaidh fearainn aca. Tha iad ag ràdh gun robh còrr air 70% de dhaoine a ghabh pàirt anns a' cho-chomhairleachadh air a' chuspair a' cur taic ris a' mhòr-chuid de na molaidhean. Ach, tha uachdarain phrìobhaideach agus buidhnean proifeasanta air teagamhan a thogail mu chuid de rudan. Tha molaidhean gus cur às do dh'fhaochadh chìsean airson oighreachdan seilge agus airson a dhèanamh nas fhasa faighinn a-mach cò leis a tha talamh am measg nam planaichean. Thuirt Ministear na h-Àrainneachd, Atharrachadh na Sìde, agus Leasachaidh an Fhearainn, An Dr Aileen NicLeòid, gu bheil an riaghaltas air a bhith a' coimhead ris na thàinig às a' cho-chomhairleachadh agus ri fianais eile a dh'fhaodadh buaidh a thoirt air a' bhile. Thuirt i gu bheil iad airson leasachadh susbainteach a chur an sàs.